The micro-abrasive blasting process uses compressed air to propel extremely fine abrasive media through small nozzles. Due to the small size of the abrasive media, even a minute amount of moisture contamination can cause the powder to clump, interrupting the media flow and bringing your entire operation to an abrupt halt. A refrigerant dryer alone is inadequate for micro-abrasive blasting. 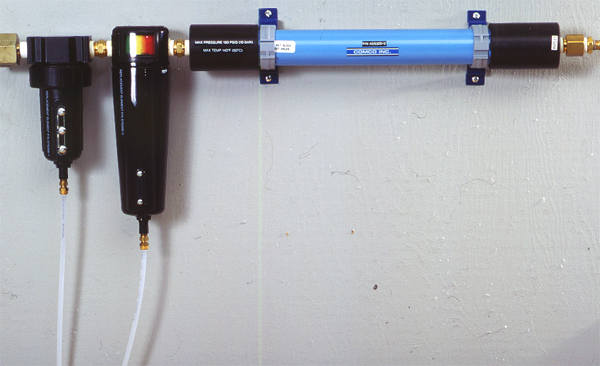 To achieve consistent abrasive media flow, the compressed air source must have a dew point of -25°F. Comco offers two lines of Air Dryers to combat moisture contamination. The AD5100 Series desiccant dryer is a good, low-cost solution for intermittent to steady use of a single Comco MicroBlaster or AccuFlo. Mounted near the blaster, a desiccant dryer contains silica gel desiccant beads that absorb moisture to dew points as low as -25°F at flow rates up to 7.5 SCFM. 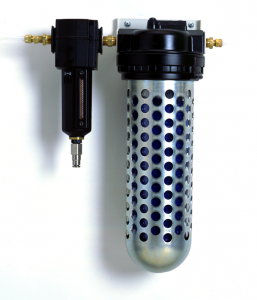 A pre-filter removes most contaminants before reaching the desiccant chamber. The air then moves through the desiccant beads where the rest of the moisture is absorbed. The beads turn from orange to green as they become saturated, indicating time for recharging or replacement. The life of the desiccant charge depends on the moisture and/or oil in the air; how much air is flowing through it; and how often the system is used. The desiccant beads are effective at removing moisture from the air line but susceptible to contamination from oil. Oil contamination will cause a film to form on the outside of the beads, preventing them from absorbing moisture. Environments that may contain oil contamination in air lines should install our air dryer equipped with both an oil and a particulate filter. Designed for continuous duty automatic operation, Comco’s AD5300 series membrane air dryers provide clean dry air with a dew point as low as -25°F and at flow rates up to 20 SCFM. Whether using multiple blasters or larger nozzles, sometimes applications demand more air than desiccant air dryers can sustain. The continuous duty membrane air dryer effectively removes more moisture from the air-line at a constant rate. This self-cleaning air dryer simultaneously removes moisture from the air stream and purges it from the dryer. Easily maintained and passive, this unit requires no external power source and only periodic inspection or replacement of the pre-filter elements to protect the membrane from particulate and oil contamination. Comco uses these efficient and durable air dryers on all automated systems.